<-- click on the image for a free PDF copy of the whole book. 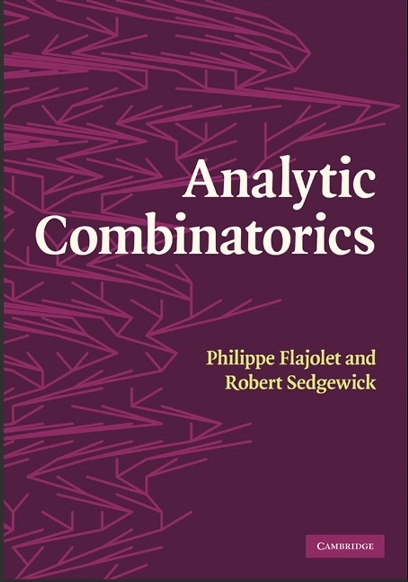 ANALYTIC COMBINATORICS: This book, by Flajolet and Sedgewick, has appeared in January 2009, published by Cambridge University Press. Free download link. 810p.+xiv. Electronic edition of June 26, 2009 (identical to the print version). [Front matter] Analytic combinatorics aims to enable precise quantitative predictions of the properties of large combinatorial structures. The theory has emerged over recent decades as essential both for the analysis of algorithms and for the study of scientific models in many disciplines, including probability theory, statistical physics, computational biology and information theory. With a careful combination of symbolic enumeration methods and complex analysis, drawing heavily on generating functions, results of sweeping generality emerge that can be applied in particular to fundamental structures such as permutations, sequences, strings, walks, paths, trees, graphs and maps. This account is the definitive treatment of the topic. In order to make it selfcontained, the authors give full coverage of the underlying mathematics and give a thorough treatment of both classical and modern applications of the theory. The text is complemented with exercises, examples, appendices and notes throughout the book to aid understanding. The book can be used as a reference for researchers, as a textbook for an advanced undergraduate or a graduate course on the subject, or for self-study. PHILIPPE FLAJOLET is Research Director of the Algorithms Project at INRIA Rocquencourt. ROBERT SEDGEWICK is William O. Baker Professor of Computer Science at Princeton University. [Back cover] * Comprehensive: generous notes, appendices, examples and exercises, as well as the inclusion of proofs of fundamental results * Unified: ties together classical mathematics and modern applications * Cutting edge: first book with extensive coverage of analytic methods needed to analyse large combinatorial configurations. [Details] 74 tones, 50 tables, 200 worked examples, 190 figures. Page extent: 824 pages. Size: 247 x 174 mm. Weight: 1.6 kg. We'll be glad to hear from you for technical comments, if you find major errors, and also if you're using this for teaching or research. Analytic Combinatorics not only provides a comprehensive theoretical treatment [...], but also makes for an interesting read: there are thousands of examples from both combinatorics and neighboring areas of science that are often accompanied by beautiful illustrations. It is a self-contained resource and the very general singularity theory developed in it can be applied to many problems, old and new. This text is a resource that should be on the shelves of everybody who studies asymptotic aspects of enumerative combinatorics and will surely become "the bible" on this topic. The ANALYTIC COMBINATORICS blog. This moderated blog is started on an experimental basis, with the hope of faciltating feedback and interactions between the book's users. Let's see how it fares and whether I can keep pace. A list of errata, to be regularly updated. Neil Sloane and a gang of dedicated volunteers maintain a wonderful On-Line Encyclopedia of Integer Sequences [OEIS]. The book repeatedly points to this monumental reference (at the moment, OEIS has more than 100,000 sequences!). Here is a concordance between OEIS and Analytic Combinatorics: AC to OEIS; OEIS to AC; plain TXT file.